Welcome to my home page, I'm an ARC Future Fellow in the School of Physics at the University of Sydney. I work within the Sydney Institute for Astronomy (SIfA), in the field of observational cosmology, focussing on a range of different areas including active galactic nuclei (AGN), cosmological parameters and galaxy evolution. My two main research themes are i) understanding the physics of galaxy formation via spatially resolved spectroscopy; ii) attempting to unravel the processes that control the formation and growth of super-massive black holes that sit at the centres of most galaxies, including the influence of the black hole on its host galaxy. As well as these, I'm also involved in projects to make precise measurements of cosmological parameters via large galaxy redshift surveys. Much of my research has been focused on large surveys of galaxies and AGN with multi-object spectrographs. Are you interested in a PhD in observational cosmology? There are diverse opportunities, ranging from measurement of fundamental parameters and the evolution of dark energy, to galaxy formation and evolution and how this is influenced by super massive black holes. Feel free to contact me at the email address listed at the bottom of this page. 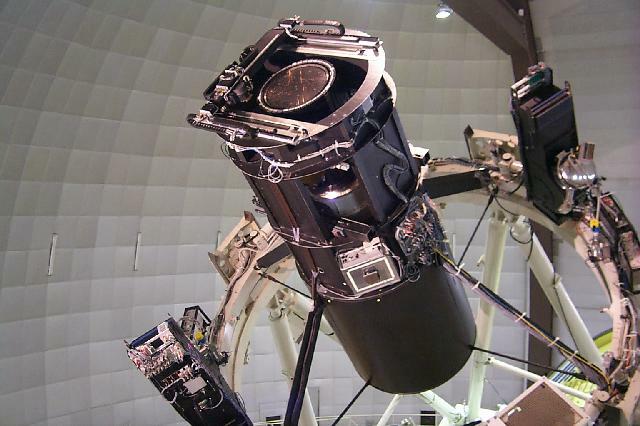 The Sydney-AAO Multi object Integral field spectrograph (SAMI) is an instrument we have built to combine the power of spatially resolved spectroscopy with large multiplexed galaxy surveys. 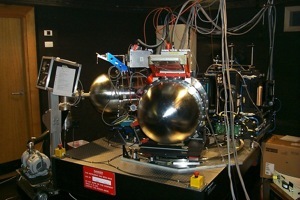 The instrument is a joint development of the University of Sydney and the Australian Astronomical Observatory, obtaining first light in July 2011. 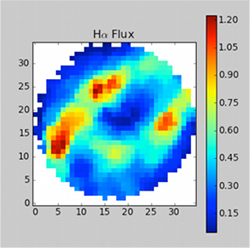 It enables up to 13 galaxies to be observed at once, each with a fused fibre Hexabundle integral field unit. I am now leading an international team that is carrying out a survey of 3400 galaxies with SAMI from 2013 till 2016 using over 150 nights of time on the Anglo-Australian Telescope. The science drivers for the SAMI Galaxy Survey include: i) understanding the physical processes behind the environmental transformation of galaxies; ii) measuring the distribution of mass and angular momentum in galaxies; iii) determining the role of gas inflows and outflows in galaxy evolution. Further details are available on the SAMI Galaxy Survey www pages. This is a new survey harnessing the power of three unique astronomical facilities, the Sloan Digital Sky Survey (SDSS), the UKIRT Infrared Deep Sky Survey (UKIDSS) being carried out using the UKIRT Wide Field Camera (WFCAM) and the new AAOmega spectrograph on the Anglo-Australian Telescope (shown right). We will be making use of the deep ugriz multi-epoch SDSS imaging data in the south galactic cap together with the YJHK data from the UKIDSS Large Area Survey (LAS) to select faint QSOs at high redshift, red/reddened QSOs at all redshifts and luminous red galaxies (LRGs) at z~1. We will then use AAOmega to obtain spectra of these targets. There is a AUS wiki for team members. NEWS: Long term status awarded for 09B-11B. A new project to measure dark energy using the scale of baryon acoustic oscillations by targeting emission line galaxies at z~0.5-1.0. This makes use of UV imaging from the GALEX satellite to selected Lyman-break galaxies. Redshifts are then measured using the AAOmega spectrograph (see above). With ~400,000 galaxies an accurate measurement of the baryon acoustic oscillations in the galaxy power spectrum can be measured (see prediction to the right). The oscillation scale can be used as a standard ruler to measure the expansion history of the Universe and therefore constrain the equation of state for dark energy. Please also see the public Wigglez page for more information. There is also a private wigglez wiki for team members. This survey combines the high quality imaging data of the Sloan Digital Sky Survey and the spectroscopic power of 2dF (right) to carry out a deeper survey of QSOs to a flux limit of g=22 and redshift of z<3 together with a sample of luminous red galaxies (LRGs) at z~0.4-0.7. Observations were completed in the second half of 2005. The scientific aims of this program are to study the evolution of faint end of the QSO luminosity function, break the luminosity-redshift degeneracy in QSO clustering and study the evolution of passive galaxies (i.e. ellipticals) to high redshift. There is now data publically available on the 2SLAQ www page. Private information for the 2SLAQ team can be found here. The 2-degree Field (2dF) QSO Redshift Survey (2QZ) was completed in 2002 and obtained over 23000 QSO redshifts (see right) using the 2-degree Field multi-fibre spectroscopic facility at the Anglo-Australian Telescope (AAT) . The survey covers two 75° × 5° declination strips, one across the South Galactic Pole and the other in an equatorial region across the North Galactic cap. the sample spans the magnitude range 18.25 < bJ < 20.85. , with a bright extension to bJ > 16 using the 6-degree Field instrument on the UKST. The survey probes redshifts up to z~3. The main scientific aims of the survey are the study of large-scale structure at high redshift, determination of cosmological parameters and deriving a greater understanding of the physics of AGN. More information on the project can be found on the 2dF QSO Survey Home Page. Private information for members of the 2dF QSO Redshift Survey team is stored here. As part of the 2dF QSO survey project we have obtained deep CCD photometric sequences in a large number of UKST fields at high galactic latitudes. This data is available to the astronomical community. Smithsonian/NASA Astrophysics Data System (ADS) ordered by date or by citation count. Alternatively, you can look at my local publications page. This is no longer kept up to date, so please refer to ADS or astro-ph for the most recent publications.